Separate the percussion even more by using the panning controls in the Drum Rack. Panning the tom to the left, for example, and the conga to the right, will make it sound more like the drums are talking to each other. Use the swing feature to make the drum loop flow even more. Swing moves the drum sounds slightly off the beat, giving the pattern more of a live sound. 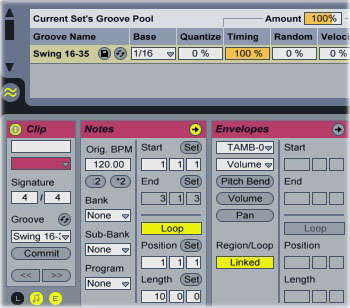 In Ableton, you add swing using the Groove Pool. Open up the Groove Pool browser, then select one of the “Swing 16” options. Set the clip’s “Groove” menu to the selected swing setting, then use the “Amount” control in the Groove Pool to add more or less swing. Finish off the beat by integrating loops and adding ghost notes.